Spaghetti with tomato sauce? Call for a Chianti. Light and crisply acidic, the Sangiovese-based Tuscan treat seems to play naturally with the tart-sweet flavor of the juicy, fresh tomatoes that go into this classic Italian-style pasta dish. But suppose you're in the mood for a bigger, more structured red? I'm not sure I would ever recommend a blockbuster California Cabernet, say, or a top-level Bordeaux with pasta and Italian "gravy." That would be too much like using a sledgehammer to put up a little nail for a picture frame. On the other hand, the hearty reds of France's Southern Rhône Valley, and to some extent their varietal imitators from around the world, offer aroma and flavor profiles that aren't entirely different from Tuscan reds, albeit typically a bit more big and bold. It's not hard to bring spaghetti and tomato sauce up to meet these big boys: Just bring a little cheese to the party. The formula is as simple as this: Cheese, particularly the grated Italian hard cheeses like Parmigiano-Reggiano or Pecorino Romano that go so well with tomato-sauced pasta, add a touch of creamy fat that gives the zippy acidity and puckery tannins of Rhône-style reds something to push back against. It worked just that way with today's featured wine, Liberty School 2008 "Cuvée," a Rhône-style red blend from California's Central Coast. Good with the spaghetti alone, it was a significantly better match with Parmigiano-Reggiano grated on for just the reasons stated: When I took a taste of pasta and sauce with the wine but no cheese, the wine was quenching but seemed to wash the tomato sauce right off my palate. With the cheese, it all came together, and the combination seemed to amplify the flavors. Grated cheese for the win! Speaking of Rhône-style wines, we're looking at the full range, not only red but pink and white, in our monthly Wine Focus for March in our online WineLovers Discussion Group. You're welcome to join in. Come join our friendly international crowd of online wine lovers as we taste and talk about international reds based on Syrah, Grenache-Syrah-Mourvedre and other Rhône varieties as well as whites based on the region's grapes. To participate in the conversation, simply click to the forum topic "New World Rhone Varieties." We don't want to leave our European friends out in the cold, so if you don't have access to New World Rhône Rangers, please feel free to join in with your local wines. FOOD MATCH: Fine with spaghetti with tomato sauce frozen from last summer's garden, best with a good grating of Parmigiano-Reggiano cheese to bring it up to the robust red wine. VALUE: Wine-Searcher.com shows U.S. Prices ranging from $10 to $19; my local price falls in the middle and seems fair enough, although I'd shop around, and send a message to the higher-priced shops by spending elsewhere. WHEN TO DRINK: The 2009 vintage is in the market now, but I'd have no worries about buying the 2008. Its blend and its good balance of fruit, acidity and tannins should ensure reasonable ageworthiness for at least a few years under good cellar conditions. WEB LINK: Click here for a winery fact sheet about the Liberty School "Cuvée," anong with a link to buy it direct from the winery for $14. 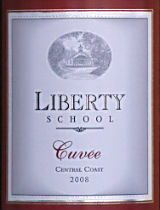 Check prices and locate vendors for Liberty School "Cuvée" on Wine-Searcher.com.